Emelie and Frederick Wahl and Fanny and John Wahl. Photographs reproduced from Alien Registration Forms. Greenwich Historical Society, William E. Finch, Jr. Archives. Donated by Greenwich Police Department. 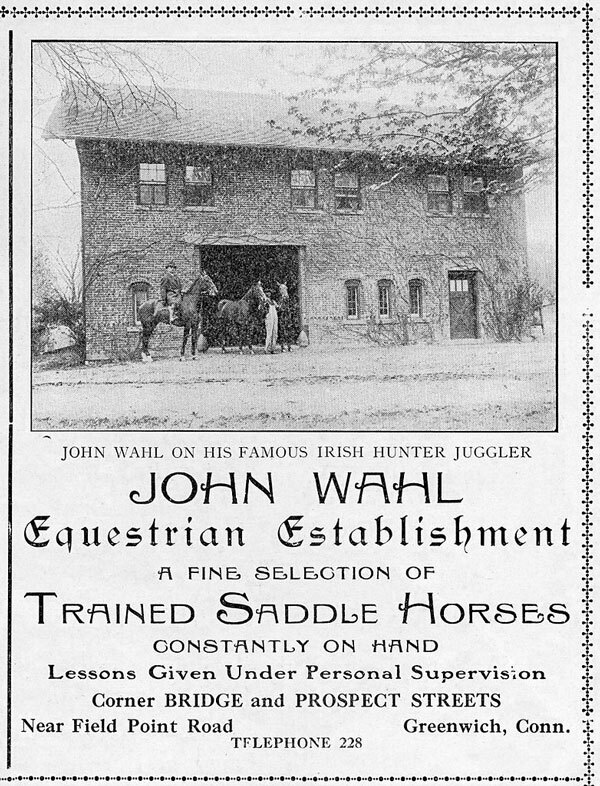 Advertisement for John Wahl's Equestrian Establishment. Greenwich Beautiful, 1913. Greenwich Historical Society, William E. Finch, Jr. Archives. 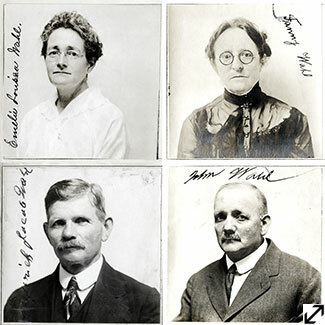 Among those obligated under law to register as enemy aliens were members of the Wahl family. Bavarian-born brothers John and Frederick Wahl immigrated to the United States in the early 1880s after serving in the German cavalry. In 1896 John came to Greenwich from New York City and set up a riding establishment. In 1902 he built his own stable and expanded the business, inviting his brother Frederick to move his family up from Florida and join him. Because the Wahl brothers had not become American citizens, they were required to register as enemy aliens. With the expansion of the definition of "enemy alien" in 1918, their wives were compelled to register as well, even though John's wife Fanny was a citizen of neutral Switzerland and Frederick's wife Emelie had been born in Poughkeepsie. Typical of many German-American young men, Frederick and Emelie's son Theodore enlisted in the United States Army during the War. American-born Teddy, who had dropped out of school at 14 to work at his uncle's stable, served in a veterinary unit. After the War, he continued the family tradition by serving as a riding master in Greenwich.